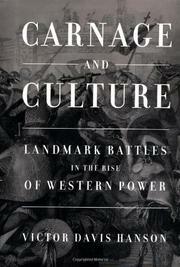 A fascinating study of the way Western values have translated into Western military victories against non-Western cultures. Hanson (The Soul of Battle, 1999) meticulously analyzes nine epic battles, from Salamis in 480 b.c. to Tet in 1968. In each account he shows how Western liberalism influenced military tactics and brought Western armies crucial victories against conservative or despotic foes. Some readers will catch an offensive triumphalism here, but most will find Hanson’s point insurmountable. Why has the core of Europe never been invaded by non-Western peoples? Why have other cultures mimicked Western militaries (rather than the other way around)? From ancient Greece to the present day, Hanson argues, Western armies have enjoyed a number of cultural advantages over their enemies. Western armies were most often composed of free men, for example, rather than slaves or mercenaries. Free men were inventive by nature and more likely to develop new weapons; they were also more loyal since, rather than being compelled, they chose to fight. Being more loyal, Western warriors were thus more disciplined and developed close-ranked shock tactics (the phalanx being the earliest example) that served Europeans well against the erratic, mob-like battle techniques of other civilizations (e.g., Islamic horsemen or African Zulus). Lastly, Western countries tended to fight wars of annihilation, whereas more warlike, despotic societies (such as the Aztecs) tended to have ritualized styles of fighting that led their armies to engage and then withdraw once their prowess has been displayed. Westerners may be slow to fight, writes Hanson, but once they start they seek to utterly destroy their opponent’s fighting capability. If one finds it hard to see a connection between the Aztecs and, say, the Japanese, consider that the Japanese could have delivered far more damage to the American navy at Pearl Harbor. Instead, after merely crippling the fleet and leaving its most potent vessels (the aircraft carriers) unscathed, the Japanese armada steamed away, expecting the soft, democratic US to sue for peace. A matchless study that combines the brutal facts of war with persuasive findings.